A full-scale eruption of the Yellowstone Supervolcano in North America occurred on February 14, 2025, at 2 a.m. In the wake of large-scale volcanism across the globe, the eruption of this volcano ushered in the planet’s Dark Years. In its initial explosion, the Yellowstone Caldera discharged eighty kilometers of magma into the atmosphere and pushed a dense bloom of pyroclastic flow over a thousand kilometers in every direction. Tephra blanketed the land over California and coastal Canada, northern Texas, and as far away as Iowa. Four thousand cubic kilometers of lava poured out of the volcano, forcing a cataclysmic blow-out of the volcano’s subterranean hydrothermal hot spots. The millions of US citizens that had evacuated inland to escape shifting tides and rising rivers (see map below) would succumb to death after months of extreme air pollution, and a lack of food and water. The eruption lasted for months, blanketing ash over most of the western United States. It smothered vegetation and polluted the fresh water supply. 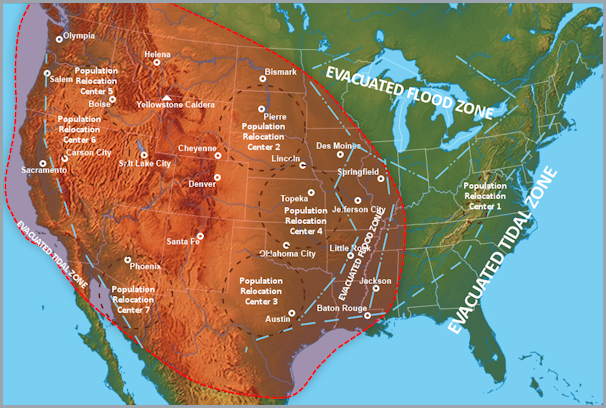 The United States and Canada had previously experienced a food crisis in the post-impact evacuation zones, created after mass migrations, war, and the breakdown of the government; these zones and the people in them, were destroyed; only Population Relocation Center 3 in south central Texas, and the Fort McMurray Refugee Center, survived the initial eruption due to each being underground facilities. The cloud of ash caused by this super-eruption, combined with the pollution brought on by the Eros Impact Event of 2022, cloaked the planet from direct sunlight for decades. The chemical composition of the atmosphere changed during a time known as the Dark Years. Over eighty-eight percent of humanity died out, creating a genetic bottleneck. When the sun reemerged around 2085, the mean global temperature had dropped by 32 degrees.